The fourteenth edition of PULSE Miami Beach ended with an enthusiastic and engaged audience and a diverse overview of the contemporary art market. The 2018 PULSE Contemporary Art Fair provided an array of programming and artistic production including emerging and socially charged voices and works from across the globe. Presented in two spacious tents, the North Tent and the South Tent, the fair focused on providing a dynamic platform for discovery and complementary viewing experiences for new and established collectors. “Notable sales were reported throughout the week by a broad range of exhibitors from PULSE veterans to first-time presenters, all noting a strong presence of well-informed, U.S. based collectors,” as per the fair’s press release. According to reports, new exhibitors such as Van Rensburg Gallery from Hong Kong got feedback from the PULSE audience that this is the fair people have found new ideas for its intimacy and vibe; while In The Gallery connected with interested collectors and clients to buy a handful of pieces priced at $48,000; and Esperanza Projects sold Richard Kurtz’s work to McEvoy Foundation For The Arts in San Francisco and the Special Collections of University of Miami Libraries. Another highlight was the works by Charlotte Keates which sold 90% on opening night alone and everything else was called for by the end of the fair at Arusha Gallery. SVA Galleries saw their first ever sell-out of an artist with Annie Kim; while Galerie Youn loved the fair and sold out very quickly, getting much attention throughout. Issue-driven works and interactive models defined PULSE’s programming again this season. 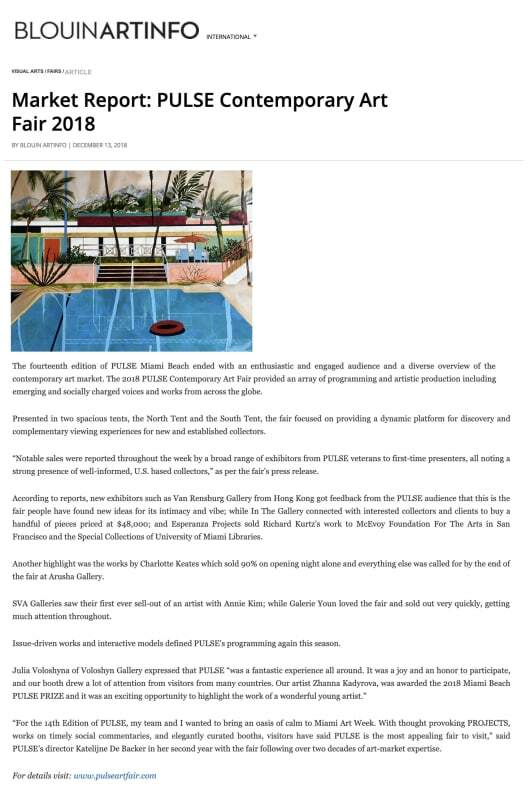 “For the 14th Edition of PULSE, my team and I wanted to bring an oasis of calm to Miami Art Week. 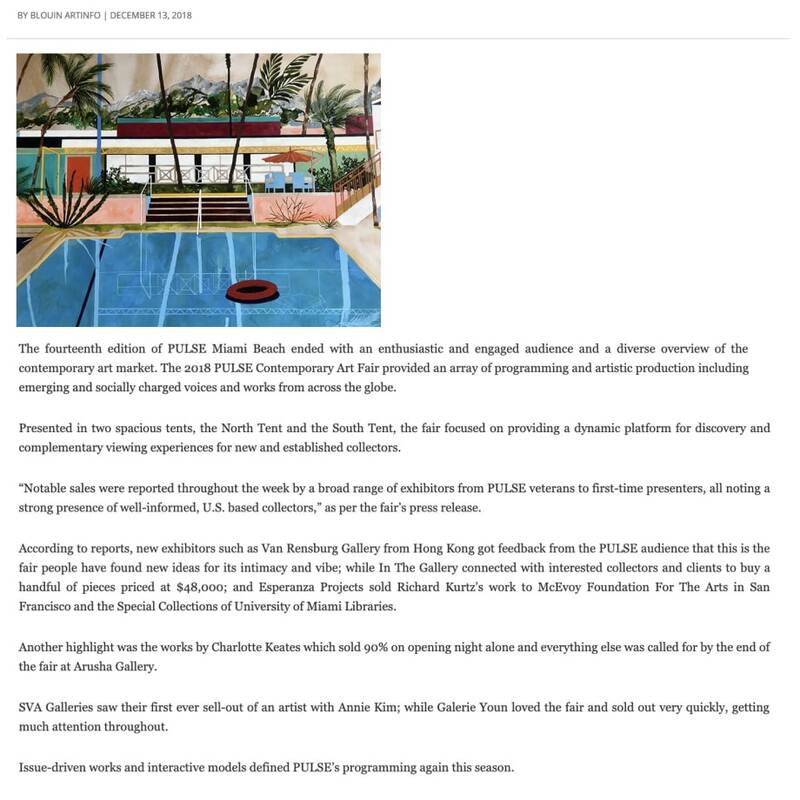 With thought provoking PROJECTS, works on timely social commentaries, and elegantly curated booths, visitors have said PULSE is the most appealing fair to visit,” said PULSE’s director Katelijne De Backer in her second year with the fair following over two decades of art-market expertise.